Every day you go back and forth from work, you may have encountered damaged roads due to either wear and tear or maybe soil erosion. Sometimes, even a few meters of damage can take weeks to get patched-up. This is due to several factors like manpower, cabling, construction materials, and whatnot the government or any private company has to consider before starting the repair work. What if there’s a solution which allows us to fix these in just a day or two? KWS, a part of the Volker Wessels company which is active in the international road construction scene, is working with Wavin and Total to develop PlasticRoad – the next-generation road pavement that’s both sustainable and environment-friendly. 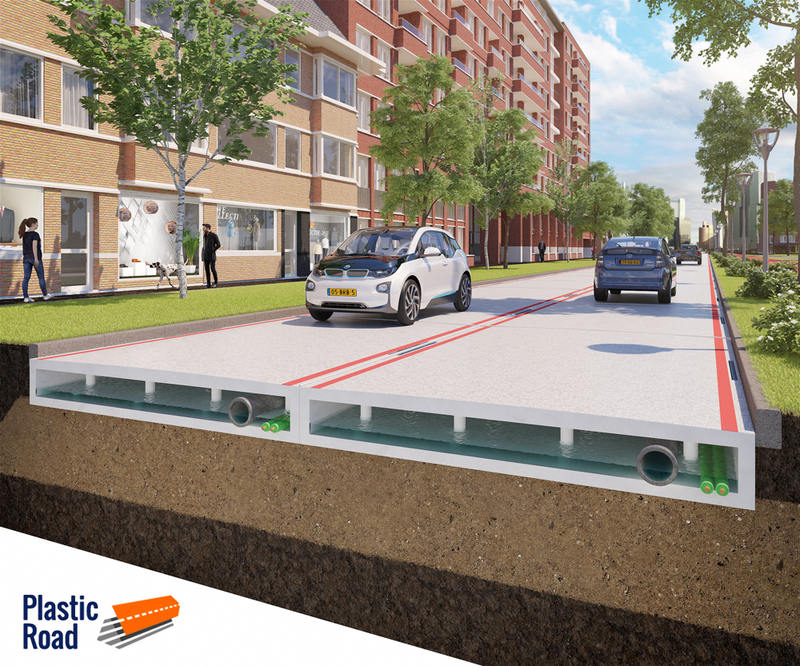 PlasticRoad is the brainchild of Anne Koudstaal and Simon Jorritsma, both from KWS – a known producer of asphalt in the Netherlands. Wavin is a company whose expertise lies on plastic recycling while Total, on the other hand, is a veteran player in the field of plastic recycling processes and polymer solutions. These three are collaborating and pooling their expertise to build the first prototype of PlasticRoad which they expect to be completed by the end of 2017. Traditional road construction takes several phases to complete. There’s surveying, removal of vegetation and other obstructive materials, foundation layout, asphalt and cement layering, and then drying and clean-up operations – it takes forever to build. Manpower, time constraints, and budget should all be taken into account for every kilometer of the construction project. PlasticRoad parts are prefabricated which help reduce construction time by as much as 70% from traditional road construction. It’s also modular, allowing easier extension or replacement of road parts. 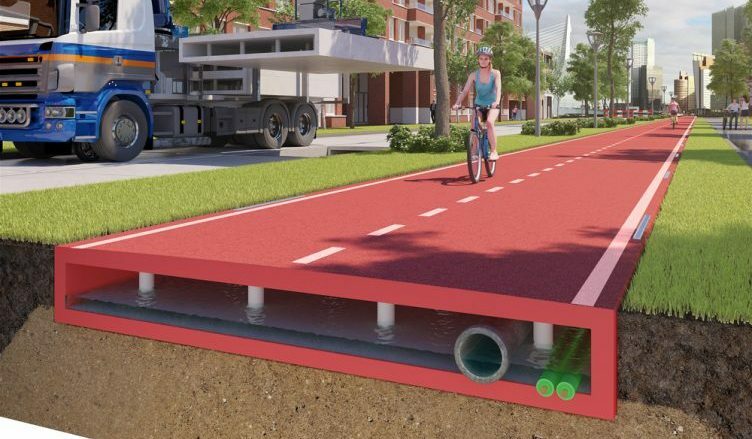 Because it’s made of plastic, it weighs 400% lighter than traditional roads, making it easier to transport anywhere needed. 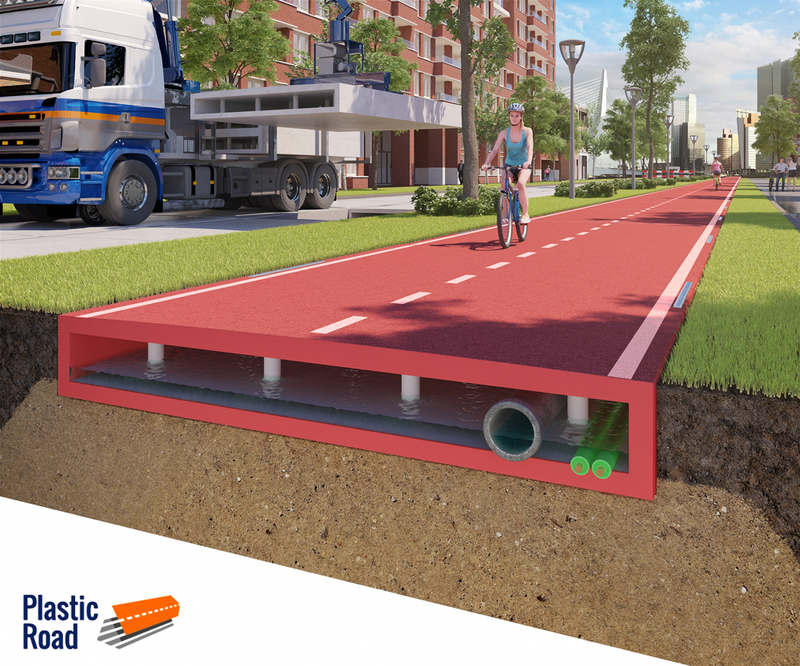 The PlasticRoad is designed to leave a hollow space underneath which can be used for numerous purposes. The allotted space can be used as a waterway to avoid flooding, providing an alternative to digging tunnels and manholes. It can also be utilized to hold cables and pipelines to prevent ad hoc excavations which may damage the road’s integrity. PlasticRoad is made of recycled plastic which greatly reduces the carbon footprint produced from manufacturing cement and similar materials. It’s also expected to last at least two to three times longer than traditional pavements which use cement and/or asphalt. As this is an innovation that’s yet to be tested, there are several risks it has to overcome. For one, there’s the possibility that the lightweight PlasticRoad may float when flood water gets too high. There’s also the issue of sound. Because it’s made of plastic and it’s hollow underneath, it might generate noise when vehicles pass through it. The consortium has taken into account these scenarios and is working hard on their business case for the project. They’re confident their combined expertise will help them get through these obstacles and present the world a product that will revolutionize road construction for the better.